Sitting Pretty with Clifton Webb. In the late 1940s, the bucolic suburb of Hummingbird Hill is shaken in its tranquil complacency by the scandalous actions of two middle-aged, unmarried men. Each of these elitist, academic bachelors threaten the norm of twin beds, parlor games, and ladies who lunch. One escapes his overbearing mother in persistent eavesdropping and snooping; the other inserts himself as a platonic wedge between a husband and wife, usurping household authority with conceited pleasure. The couple eventually separates under the strain, while the community itself is exposed for its flaws and hypocrisy. The convention of the two-parent, heterosexual family and its corresponding social order is besieged from within by men who exist outside the tradition. A tart meringue masquerading as sugary fluff, Walter Lang's Sitting Pretty, adapted by F. Hugh Herbert from Gwen Davenport's novel Belvedere, serves a funny, cutting slice of social commentary that wrestles with the fear of the unconventional. Reading such subversive possibilities into an affable comedy frequently seems reaching, but the jaunty Sitting Pretty is at the very least “gay” in multiple ways. 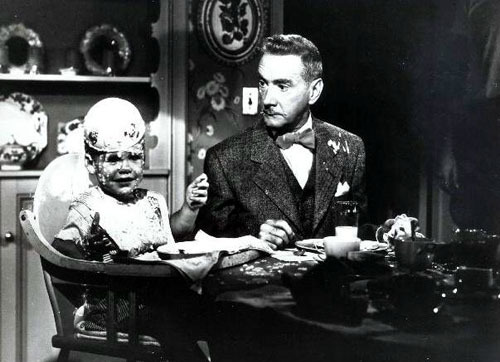 Clifton Webb, Academy Award-nominated for his hilarious introduction of the Lynn Belvedere character (there would be two follow-ups), is the pompous intellectual who answers the call of beleaguered middle-class parents Harry and Tracey King (Robert Young and Maureen O'Hara) for a live-in babysitter. Belvedere is arrogant and snippy, and willingly serves in a position understood to be feminine. Webb presents Belvedere, the antihero of Sitting Pretty, as a slightly more benevolent Waldo Lydecker, replacing the sociopath acidity of Laura's poison-pen columnist with pretentious, self-centered good humor. Though Belvedere is largely asexual, the combination of actor and character carefully code him homosexual. And Belvedere is not the only one lurking in Hummingbird Hill. Less tactfully – but every bit as daintily – inferred as gay is the other middle-aged bachelor in the neighborhood, Clarence Appleton (Richard Haydn). As conspicuous in his snobbery as Belvedere, but with less pedigree to back his conceit, Appleton spends his time lifting pollen specimens from his neighbor's yards when he is not snooping (sometimes with his mother). A dandy botanist, Appleton is an Oedipal hothouse of representations; his secretive plucking of flowers surrounded by the three young King boys is a brief, subliminal admonition. That he emerges as the chief villain through several bitchy, verbal catfights is by no means surprising. The scandal that eventually rocks Hummingbird Hill is provoked by the deceptive actions of Belvedere, but Appleton is the qualified fall guy. Yet, the primary wrongs precipitated by these men are simply crimes of exposure, of revelation: the community is rotten starting at its core. Its foundation – the nuclear family represented by the Kings – has broken down into disorder. Sitting Pretty humorously comments upon the failures of families moving into the suburban era: working fathers are strangers to their children, stay-at-home mothers are lost in issues of self-worth, teenagers are going wild jitterbugging, etc. Allowing a single man – possibly coded as homosexual at that – to establish control and command authority over a traditional family is a remarkably subversive statement. The subversion is short-lived in Sitting Pretty, however, as the failures of father and mother and the various suburban caricatures are succinctly set aside in favor of stacking snarky Belvedere against flaky Appleton. Though the Kings lack lessons learned (in fact, they are busy adding another child to a family they cannot manage), the film ultimately favors men on the peripheries of acceptable suburban life as the wrongdoers. In the midst of the developing political witch hunt soon to consume Hollywood, perhaps it is not too shocking that even a deceptively light and airy comedy should reflect larger fears. But despite Sitting Pretty's mixed social message, in the end it's Clifton Webb's Lynn Belvedere who emerges as essential to the stability of the King household. That the film concludes with this conspicuous contradiction may be as salient as any of Belvedere's catty, acute bons mots that precede it. Loved this film when i was a kid, haven't seen it since. I'll have to catch up again one of these days. There were “Mr. Belvedere Goes to College” with Webb, Shirley Temple and Tom Drake, and “Mr. Belvedere Rings the Bell” with Webb, Joanne Dru, and Hugh Marlowe. there was a followup movie after sitting pretty with the same characters. I wish to know the name of it because I loved that movie too and qwould like to order it.